When the floors in your business begin looking worn, make American Flooring Removal the experts you call. The flooring in your business is one of the first things a potential customer or client will notice when they come to your building. If your tile, hardwood, laminate, concrete, or natural stone floors need to be replaced, you need an affordable solution that leaves your business with more of your hard-earned profits. Until now, it has been impossible to avoid the traditional flooring removal processes and equipment that creates the massive havoc on the daily routine of your business. Making sure the floors in your home are going to secure not only the beauty and flow of the atmosphere for you, your family and visitors but also increase the value and quality of your McKinney home. At American Flooring Removal, we understand that your investment is extremely important and we take it seriously your trust in our craftsmanship and remaining on target with your budget. We also understand that the last thing you want to deal with is the mess and incredible inconvenience on you and your family. Our licensed experts are dedicated to provide your home and family with the best possible excellence in all you flooring needs. There are so many McKinney homeowners and business owners who have been waiting a long time for an affordable, fast, and environmentally solution to their flooring removal needs. American Flooring Removal in McKinney is here with the solution to your dust-free, fast affordable, and efficient flooring removal needs. Whether you have tile, hardwood, Saltillo tile, ceramic, or many other types and styles of flooring, there is absolutely no better company to call than American Flooring Removal. Our dust-free, environmentally friendly equipment and clean, efficient process make us your best choice in the McKinney and greater Dallas-Fort Worth metro area. If you are looking to remove and replace your floors, you are going to want an affordable, fast, clean solution while staying in your budget and not delaying your time frame or sacrificing on quality. At American Flooring Removal we continually seek to bring you to your dream design as quickly and efficiently as possible for your McKinney home or business. With our affordable, clean, fast flooring removal options, home and business owners now have an ideal choice. No matter your flooring removal needs, American Flooring Removal is the top choice for the McKinney area. There is nothing more inconvenient in navigating the process with your home than having to be completely put out of your home or business, along with having to clean up all the dust and destruction of removal. At American Flooring Removal, we understand the pain of having a dusty house or business when all you wanted was a new floor! From the very beginning, this is why we strive to ensure our process is dust-free and environmentally friendly. Our state-of-the-art equipment removes the need to have all the plastic drapery and coverings that traditional flooring removal processes require to minimize dust and debris. Even the smallest remodeling projects can create pounds of harmful dust particles, and we want to make sure your family, employees, and customers can live and work in a safe, dust-free environment after your floors are removed and replaced. Our industrial-grade, dust-free equipment has the power to remove the floors from a house or business building in less time than traditional flooring removal equipment can manage. And our efficient process leaves a superior, flat, clean subfloor ready for your new flooring installation. With our up-to-date processes, highly skilled professionals, and state-of-the-art machines, American Flooring Removal in McKinney promises incredible results in record time. The licensed experts at American Flooring Removal may not be the only flooring removal company in the greater Dallas Fort Worth area, but they are confident that they are the only one for you! Whether you need a residential or commercial solution to flooring removal and replacement, American Flooring Removal promises a quick, budget conscious, dust-free removal solution, each and every time. Our dust-free method leaves your floors perfectly prepared for the next step in your replacement and revamping project, and our easy cleanup helps you save money. Let us show you how American Flooring Removal can save you hassle, money, and time in your next renovation or home improvement project. We take your investment seriously, which makes your investment and priority our investment and priority. Your hardwood floor looks absolutely stunning. However, it might be time for a new layer of wood flooring, or perhaps a new color. If you feel the same way, then it’s time to schedule wood floor removal in McKinney. Here at American Flooring Removal, we use exceptional, unique, and dust-free methods to remove your old wood flooring without any hassle. We have both the tools and training necessary to tackle wood floor removal in the easiest, quickest manner possible. You may be removing your old wood flooring because you are seeking new opportunities. If so, then let us tell you how we can help make your dreams come true. It wasn’t long ago that removing old wood flooring was a messy endeavor. You were left with dust, debris, and just a complete mess everywhere. With our method, we’ll remove the old floor, without any dust, and leave the space open for new possibilities. Your new floor will be ready to go immediately! Exceptional customer service, quality craftsmanship, and clean efficient flooring removal is so very important to each of us at American Flooring Removal. It is our promise that we can handle any residential or commercial project in the McKinney and the greater Dallas-Fort Worth area. Call us or Contact us to schedule a consultation or quote today! We serve entire Mckinney, TX 75013, 75069, 75070, 75071, 75072. I'm very pleased with the outcome of our tile removal. The crew members were polite and professional, and did an excellent job. They definitely exceeded my expectations, and it's truly unbelievable with how well they contain all of the dust. Ken, Josh, and crew were the best. I highly recommend this company! No dust, fantastic job cleaning up afterwards! It was a pleasure having Josh and his team remove a couple hundred square feet of tile in our home. They were very professional and did a great job cleaning up afterwards. I would highly recommend them, and would definitely use them again! I was amazed at how they were able to do the tile removal without filling the air up with dust. 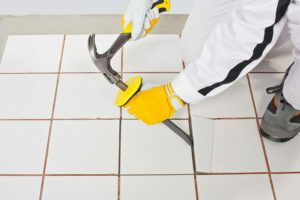 This is definitely the best way to go to avoid all of the dust issues associated with tile removal. Excellent! Don't go traditional removal. Ken was great and the crew was professional and quick. So much better than traditional removal. Impressed! Thanks!